The inspiration for the above painting came from several photo references. I recently suggested to my students, taking the composition class, that they could free themselves a little from the constraints of working from one photograph. I felt this would open up a new world for them to create from. 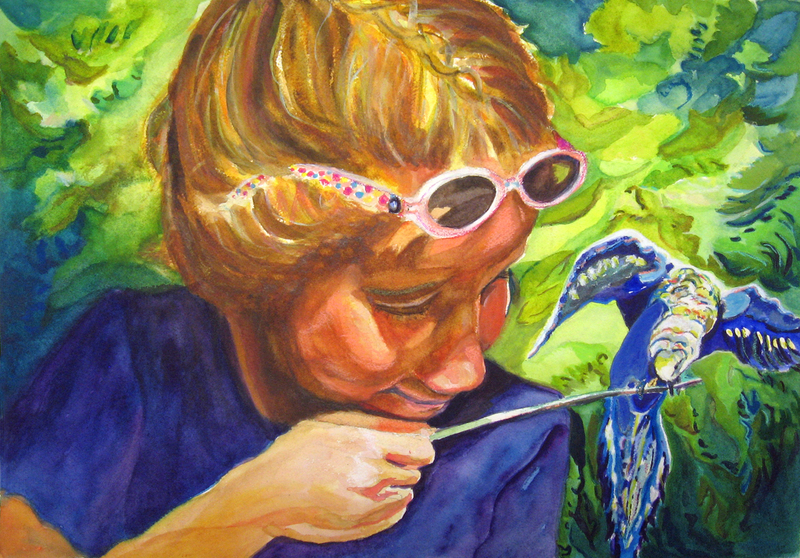 We become, over time, so attached to working from one photograph that we forget that we have a wealth of information available to us from real life and our techniques we have learned from watercolor class. They were to take a landscape photo that really liked and include a dominant tree, something man-made and something living (other than a plant); like people or animals. 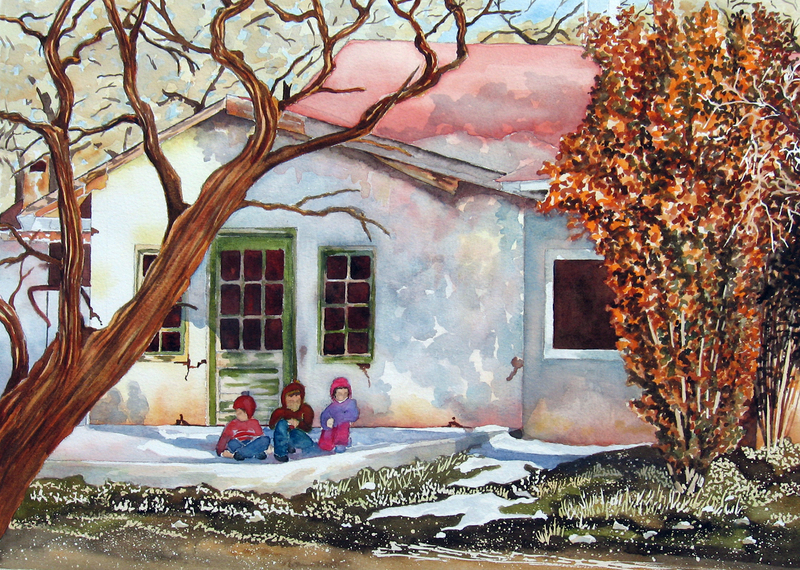 I chose a photo my sister had taken in New Mexico during the winter months and it included this worn home and the large shrub -like trees on the right. I searched Wet Canvas for a photo of children and found the three placed here on the porch of the home. I chose a tree from a grouping I found in my photo reference book for artists and used a portion of it for the large tree in the foreground that overlaps this scene. The challenge became working with the values and colors of each of my photographs, as well as their proportions. The tree in the foreground had to be enlarged for this scene and the colors changed to balance with the warm oranges and reds in the prominent bushes on the right. The children became “wee” images of the original reference I had available. I had to change their clothing colors so they would be visible and not become lost in shadows cast by the large bush-like trees on the right. I was attracted to the splats of light in this as well as the long shadows reminding me of the early morning light in late February as the days are becoming longer and the promise of spring is right around the corner. I imagined the children I had created as waiting for their school bus. 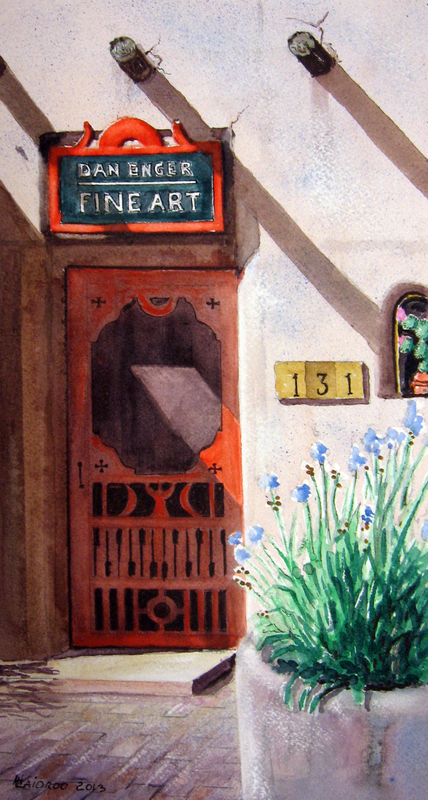 I liked that creating a painting with guidelines like this prompted me to create a story. How interesting when we take that extra step into creating with what we have at hand…..
Olly is my friend’s husband’s dog. He is also a friend to Hailey, featured in the previous post. 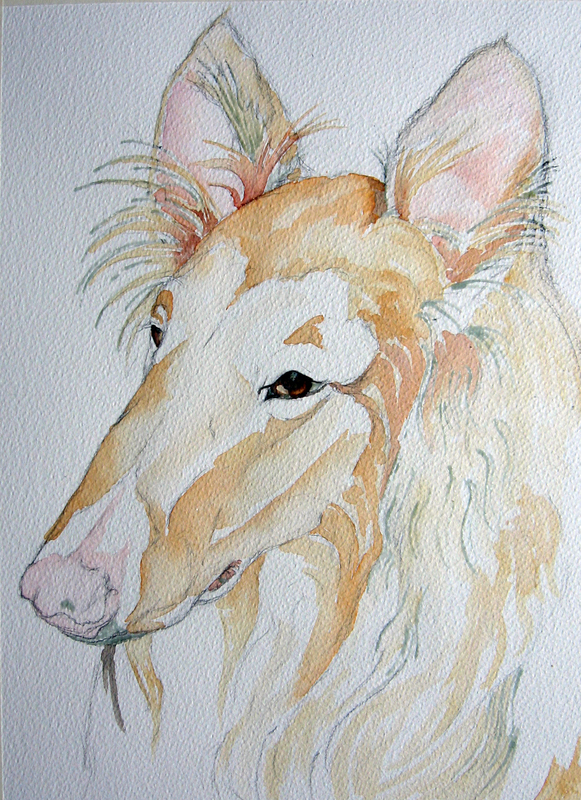 I really enjoyed painting these two collies. 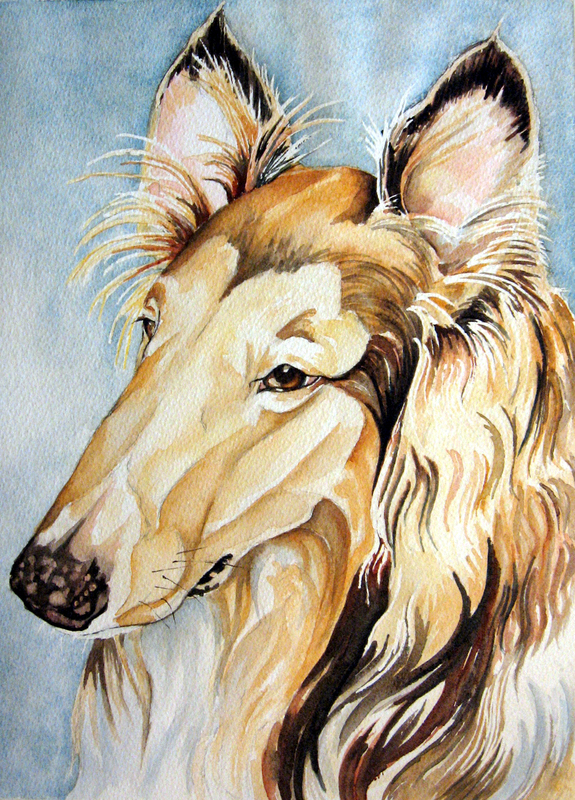 Olly is the Rough Coat Collie, like Lassie of TV fame. The one thing I had to concentrate on, throughout painting him, was that his painting may hang with the one I did of Hailey. This is why I faced him left. That way, when they hung on the wall, they would face each other. The other thing I had to be aware of is that they would look better if paintied in much the same style, using the same color scheme. That is why the background is the same and I approached sculpting the forms of his face similar to the way I painted Hailey. I have never attempted something like this before, so that was a learning experience. Above is my initial drawing. I had to draw him twice. The first attempt was way off! I had trouble with getting the length and width of his nose correct. I used cross hairs the second time and that did the trick. My perspective had been off. Olly had white hairs running through his coat, so I frisketed those. I also frisketed the highlight in his eyes as well as the lighter areas to either side of his iris and began adding the first tentative strokes of color. This step was largely sculpting the nose forms and studying where I would need to have lighter color under darker color. I felt a need to establish the darkness of the eye because many of the darks in Olly’s coat matched the values found in his eyes. I pinked the nose as my initial step on that and pinked the shapes on the inside of his ears. These were all the lighter colors I saw under and around the darker values I had yet to render. In this step, I did most of my painting. I frisketed the pink dots on Olly’s nose. I darkened the areas of dark coat in the way I read the patterns. 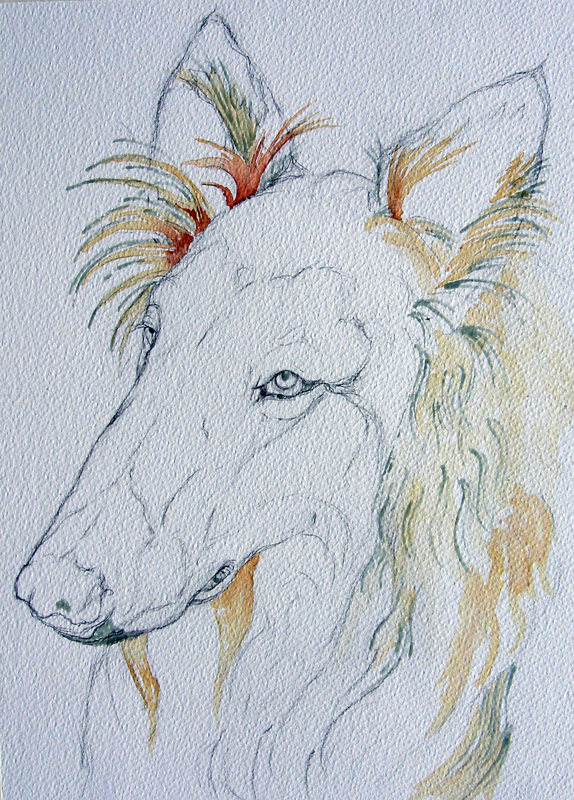 I frisketed more of the long hairs from his ears so the would show up after laying in the background. I, then painted the background in. 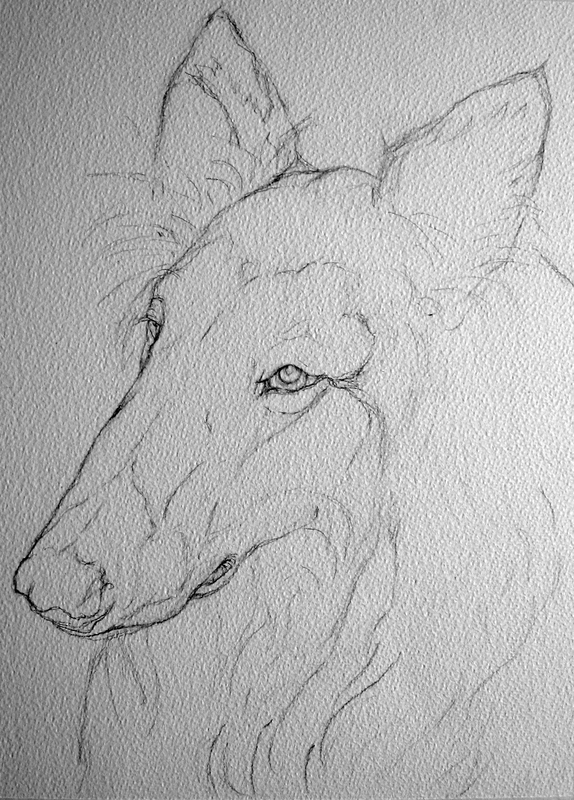 I knew I’d need to do that so I could finish my darks in his ears and his nose and have the correct value tones. So many times, I have painted the background in, only to find I had to retouch the portrait because the background lightened the foreground dramatically. At this stage, I always know how I am going to finish a painting. I have enough information down and it is just a matter of detailing and getting the darks to read right. In the last step I detailed the darks in the ears and painted in some of the white hairs that poked out from around them. 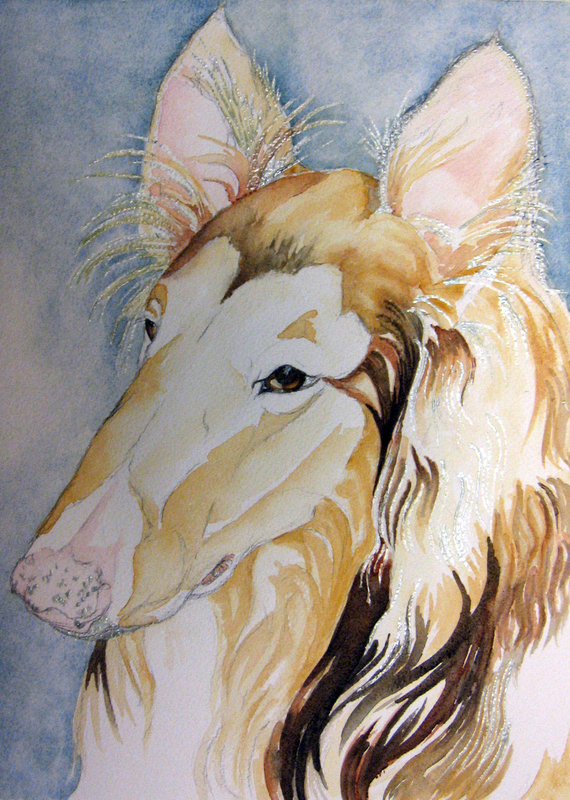 I detailed the nose and mouth, darkened the darker portions of pattern in his coat, erased the frisket and worked on softening some of the edges around those frisketed patches. I darkened the whites on either side of his iris and painted a faint shadow under the upper lid of his eye. I added the whiskers with a rigger. The last thing I did was shadow the coat under Olly’s chin with a mixture of the blue I used for the background and a light touch of the browns I had used. I also shadowed the white patch of his coat in the lower right hand corner for balance.